Barnes gets his information on climate change the same place everyone in the right-wing media world gets it: from Marc Morano, the in-house blogger/agitator for Sen. James Inhofe (R-Okla.). Morano’s entire job is to aggregate every misleading factoid, every attack on climate science or scientists, every crank skeptical statement from anyone in the world and send it all out periodically in email blasts that get echoed throughout the right-wing blog world and eventually find their way into places like Fox News and the Weekly Standard. From there they go, via columnists like George Will and Charles Krauthammer, into mainstream outlets like Newsweek and the Washington Post. How did we know about Roberts’s latest blog post? Well, we got an email from Marc Morano about it. The conservative movement gets its information about climate science from the office of James Inhofe. What more really needs to be said? Well, quite a bit more really needs to be said. Such as what is supposed to be wrong with that, even if it were true? Which it isn’t, as there are a number of email list servers of interest to sceptics. And it’s not as if there are no green newswires spewing less than perfect information. And it’s not as if that transparently false information never comes from Grist. Roberts’ inability to self-reflect is painfully obvious to anybody who is not him. As we pointed out, scepticism cannot be in itself ideological. On the other hand, Environmentalism – which, after all, demands that we reorganise the global economy, monitor every productive endeavour, and regulate lifestyle – is an ideology. But it hides its politics behind science. ‘Science’ is environmentalism’s fig leaf. Behind the green veneer is its shame. What a cautious lifting of the fig leaf reveals is that the object of Roberts’ anger is democracy itself. He doesn’t seem to like people having email lists with which to communicate ideas. Just as he doesn’t like people being able to travel, or to consume according to their own needs and desires. Accordingly, Roberts needs to turn democratic expression into a subversive, nefarious activity. In this fantasy, what are in fact normal forms of communication appear as sinister conspiracies. Two people knowing each other is an element… a cell… of a dark network standing against science…. truth itself. But the reality is that the recipients of Morano’s emails are people who can see for themselves what an email from a – shock horror – Conservative actually consists of. We’re not conservatives, and you don’t have to be a conservative, for example, to know that when James Hansen says that there are just four years left to save the planet, he’s talking unmitigated BS. And yet it was an email from Marc Morano which first drew our attention to the story. It’s just a way of distributing news. Everybody who comments on the news is connected to many similar services. We get daily digests on topics from the newspapers themselves, from Government departments, NGOs, Quangos, political parties, charities, and from Google news alerts. Some of these sources are neutral. Some have a clearer agenda. Of course, Sen. Inhofe is a Conservative. But his take on the climate issue is a little deeper than Roberts gives him credit for. It is becoming increasingly clear that man-made global warming is not a partisan left vs. right issue. It is a scientific question and the promoters of global warming fears now realize they have significantly overreached. … emerges dizzy from his own spinning and thinks it is the world that’s confused about what direction it is moving in. And this is his fundamental problem. Everything he writes is a projection of his own inability to understand a world that fails to conform to his expectations. The ideas he uses to orientate himself fail to give him purchase on his own existential crisis; they crumble underfoot. Like Monbiot, Roberts see a challenge to his perspective as a catastrophe. He cannot countenance dissent. It would be the end of the world. Roberts’ can only explain his objection to conservatism in terms of environmental catastrophe, because he doesn’t possess a principled, coherent objection. Fantasy takes the place of insight and shrill posturing the place of careful argument. Just over a year ago, we picked up on a post at the miserablist blog, Grist, by Professor Andrew Dessler, former scientific advisor to the Clinton administration. Dessler had compared the planet’s ‘suffering’ from climate change to a child with cancer. ‘Who are his parents going to take him to in order to determine the best course of treatment?’, Dessler asked. Not to the ‘quacks’ (the ‘sceptics’). Better take the child to the real doctors (the IPCC). Expertise matters. Not everyone’s opinion is equally valid. The list of skeptics on the EPW blog contains few bona fide climate specialists. In fact, the only criteria to get on the list, as far as I can tell, is having a PhD and some credential that makes you an academic. So Freeman Dyson makes lists. While I’m certain he’s a smart guy, I would not take a sick child to him, and I won’t take a sick planet to him either. In both cases, he simply does not have the relevant specialist knowledge. That also applies the large number of social scientists, computer programmers, engineers, etc., without any specialist knowledge on this problem. The bottom line is that the opinions of most of the skeptics on the list are simply not credible. As Dessler discovered – after we told him – the IPCC is substantially comprised, not of climate scientists (aka ‘doctors’) but exactly the ‘large number of social scientists, computer programmers, engineers, etc., without any specialist knowledge on this problem’ that he accused the membership of the ‘Inhofe 400’ list of being. We surveyed the IPCC authors from WGI, WGII and WGIII hailing from the UK and USA, and found that Dessler’s characterisation of the IPCC didn’t stand up to scrutiny. If Dessler’s claim had not been made by Dessler, but by some run-of-the-mill political hack, his mischaracterisation would be inconsequential. But Dessler cannot claim to have been unaware of what the IPCC is comprised: he’s a climate science professor, and was an advisor to the Clinton administration. If he is was ignorant, he’s employed well above his ablilty. If he wasn’t ignorant, then he’s a straightforward liar. Dessler’s shrill tones have not diminished during 2008. Following an article on the usually ‘liberal’ Huffington Post by Harold Ambler, Dessler writes today that Ambler’s article was ‘replete with gross factual errors about the science of climate change’. Word is that this was an editorial slip-up on HuffPo’s part; they don’t typically provide a place for this kind of agitprop. The essay is gone from the site’s portal pages and rumor has it The Huff herself may address the issue soon. It is always interesting to discover ‘liberals’ acting illiberally. And it is when climate scepticism threatens environmentalism’s influence over the liberal camp that liberals who have bought the green cause get really illiberal. Consider, for example, Bjorn Lomborg, who has never ‘denied’ global warming, climate change, nor that they represent serious problems which ought to be addressed, probably by government intervention. In spite of his rather mild (in comparison to many sceptics’ claims) position, Lomborg was the subject of more vitriol from the alarmist propaganda machine than perhaps any other climate-sceptic/denier/realist figure. Why? Because he is – look at him – super liberal. As liberal qualifications go, you don’t get much more liberal than a gay vegetarian Danish academic. (Denmark – for those who don’t know, is perhaps the most liberal place on earth: it has a tax rate that would make many conservatives go into anaphylactic shock, it has a huge welfare state, and has the lowest income inequality in the world, not to mention one of the highest standards of living.) Whatever you want to call him, the word ‘conservative’ just doesn’t really sum him up. And that is why he terrified the environmental movement. It’s not because he challenged the science, it is because he threatened the political project. He offered a rational and pragmatic methodology to assess the world’s problems that was consistent with liberal values. And in reply, the environmental movement went ballistic. So let’s get this straight, the substance of Harold Ambler’s unremarkable essay is of little significance. What’s got up Dessler’s nose is that it was published on the liberal/left Huffington Post. To allow liberals to fall out of line on the climate issue would be to reveal the nebulous character of mainstream liberal thought – without the spectre of immenent catastophe, there’s not much keeping it together. Hence, Dessler diminishes the essay as ‘agitprop’ and welcomes its removal from the ‘portal pages’. Dessler’s rhetoric does two things. First, it tells the reading liberal what to think and legitimises censoriousness. More importantly, second, it fires a shot across the bows of any liberal organ which dares to entertain a climate sceptic on its pages in much the same way as Martin Durkin’s Great Global Warming Swindle (just 90 minutes of TV in a shedule jam-packed with environmentalism) drew furious comments about Channel 4 from the Great and the Good. It threatens to withdraw the moral authority loaned to liberals by climate science. If Mahatma Ghandi were still alive and dared to express scepticism about the climate issue, ‘liberals’ reading the ‘liberal media’ would struggle to identify the difference between his views, and those of Ann Coulter. We have reported before how climate alarmists seek to draw parallels between the shape of arguments made by the morally reprehensible, and climate change “denialists“. At the same time, some like to make analogies of climate scientists and physicians. Andrew Dessler, professor in the Department of Atmospheric Sciences at Texas A&M University, former scientific advisor to the Clinton Whitehouse, and climate change activist blogger at Gristmill does both. The association between sun exposure and skin cancer is every bit as robust as the association between greenhouse gases and climate change. And that means it’s pretty damn robust. What’s interesting is that the Indoor Tanning Association seems to have virtually plagiarized the strategy incorporated by tobacco companies and global-warming denialists. The phrases “hypothetical risks” and “no compelling scientific evidence,” along with efforts to smear the mainstream scientific community with accusations of corruption, are right out of the global-warming denialists‘ handbook. This really underscores the effectiveness of the strategy. Regardless of how strong the evidence is — whether it’s the connection between smoking and lung cancer, exposure to sunlight and skin cancer, or greenhouse gases and climate change — it seems possible to create doubt in the general public’s mind with a concerted PR campaign. What is interesting about Dessler’s inability to discuss global warming without recourse to crude analogy is that it reveals a strategy of his own, and the poverty of climate change “ethics”. Climate alarmists find it so difficult to connect their arguments to people that they need to seek abstract parallels in the structure of dubious arguments, and those of their opponents, despite their being totally unrelated. Thus we see Naomi Oreskes struggling to identify continuity between the legal defence offered by tobacco companies and the inertia of the environmental movement in the USA. And we see Marc D. Davidson attempting to diminish the moral character of climate change “deniers” by comparing their arguments to the arguments in favour of the continuation of slavery made nearly 200 years ago. These are sure signs of the exhaustion of the climate change argument. It borrows the moral high-ground from history, but struggles to make the moral case for ‘action’ on its own terms; climate change denial is the equivalent of being in favour of the slave trade. The climate change argument borrows scientific credibility from medicine; climate change is like cancer, and climate scientists are like doctors. This unsophisticated reasoning isn’t designed to shed any light on the matters at hand. It merely uses this borrowed moral and scientific certainty to position climate alarmists on the “good” side. Do Environmentalists Want to Save the Planet or What? Weird. Because chemotherapy is rather more useful than diet and exercise when it comes to, say, curing someone of cancer. It’s even weirder for the fact that Gristmill’s last weird analogy, by Romm’s fellow scientist and Green oracle Andrew Dessler, likened the planet to a sick child in need of expert medical advice. Romm, it seems, would rather turn Dessler’s sick child over to some TV nutritionist to get them jogging and eating more broccoli. The thrust of Becker’s piece is that the planet might be screwed, but that efforts to mitigate global warming through geo-engineering – giant mirrors in space, the injection of aerosols into the atmosphere, carbon sequestration, seeding oceans with iron oxide, and that sort of thing – are unethical and impractical. Intergenerational ethics argue against us leaving massive, intractable problems for future generations, forcing them to deal in perpetuity with nuclear waste, carbon sequestration sites, and geo-engineering systems – all subject to human error and to failures that would be deadly. Think of dams and levees designed to control rivers so that people can live in natural floodplains – sometimes with disastrous results ... Geo-engineering is born of the dangerous conceit that human engineering is superior to nature’s engineering … Lacking regard for natural systems, we have upset them … we lack humility. The Greens’ resistance to geo-engineering sits very uncomfortably with its message that the planet is screwed and we’re all going to die. It suggests that Environmentalism has less to do with saving the planet than it does with reining in human aspirations. It suggests that they don’t actually believe their own press releases, and that they know the situation is not as dire as they would like the rest of us to think it is. And that Environmentalists are cutting off their noses to spite their faces – “we’ll save the planet our way or not at all.” It suggests that Environmentalists regard science and engineering as the cause of problems, and not the solution. Even if [geo-engineering] were able to stabilize climate change – which is doubtful … We still would be addicted to imported oil, still would be subsidizing terrorism with our gas dollars, still would suffer the cost and supply traumas that are inevitable with finite resources, still would send our children off to die in resource wars, still would pollute the air and cause respiratory problems for our children, and still would wipe out species, many of them beneficial to us, as we invade their habitat. As if reducing CO2 emissions would stabilise the climate. The weather will continue to pick off those who are not buffered against it regardless of whether climate change predictions are realised or not. As if a stable climate would prevent resource wars or global terrorism. If anything creates resource shortages, Environmentalism does. Indeed, by drawing on the dangers of terrorism to justify environmental politics, Becker merely demonstrates how Environmentalism and the War on Terror are united in their deployment of the Politics of Fear. There are good reasons to think that geo-engineering cannot stabilise the climate either. Control of the climate might well be too much to ask of a strategy that manipulates a single variable in a hugely complex system. And yet the tweaking of a single variable – CO2 emissions – is precisely what the Greens are demanding. Contrary to Romm’s analogy, the Greens’ efforts to save the planet are far more like chemotherapy than diet and exercise. After all, it is the Greens who liken humanity to a plague, virus or a cancer infecting planet Earth. And their insistence that we batten down the hatches, tread lightly on the Earth, ration our energy and bow to the superiority of Mother Nature would leave us even more vulnerable to her whims than we are already. Engineering fixes for global warming are, says Becker, “born of desperation”. Quite possibly. But what he should be asking himself is who created the climate of desperation in the first place. Author EditorsPosted on March 24, 2008 Categories BlogTags Andrew Dessler, Bill Becker, geo-engineering, Grist, Joseph Romm1 Comment on Do Environmentalists Want to Save the Planet or What? As before, we’ve limited ourselves to those contributors based in the UK or USA. That gives us 303 authors to work with out of a total of 618. That’s nearly half the total – strange, for an institution which claims to represent scientists from all over the world. It was very difficult to establish the discipline, background and level of expertise of scientists who work at the UK’s Hadley Centre and Meteorological Office, and NOAA and NASA in the USA, as they tend not to have personal web pages. 31 of the UK contributors work at the Hadley Centre, 43 of the US contributors work at the NOAA. Where we have been unable to locate these people properly (nearly always), we’ve given them the benefit of the doubt, and included them in the same category as scientists in climatology, meteorology, and oceanography. There were 215 scientists in this category. So there is certainly a higher proportion of people who could reasonably be called climate scientists in WGI compared with II and III. But it’s worth pointing out that this figure is also boosted by a whole bunch of people who work in climatology but who are modellers by training. That’s not to knock modelling – well, maybe a bit – but it does raise questions about what a climate scientist actually is, when you get to call yourself one even if you’ve spent most of your career modelling traffic flows or whatever. We’ll try to come up with some numbers for that at some point. As for the other 88, 24 are atmospheric physicists, 27 are geophysicists or geologists. Arguably, these could also be lumped in with the so-called climate scientists. Ach, what the hell, let’s call it 266 climate scientists out of 303. Of the rest, we have four statisticians, eight mathematicians/physicists, eight engineers, two biologists/ecologists, and one each from history of science, computer science, and a lonely economist. There were also solos from an NGO, an agronomist, and a lawyer (who curiously seemed to double up as an oceanographer). Which leaves another eight whose expertise we can’t establish. So, across WGI, II and III, we have a very generous 314 contributors among the 510 we sampled who can reasonably be described as scientific experts. Which scales up to 1539 out of the putative 2500. Some of our critics have argued that it was dishonest to look at WGII and III, and that the climate scientists are all in WGI. Of course WGII/III are not all climate scientists. This criticism misses the point that the IPCC is neither, as is frequently claimed, 2500 of the worlds best climate scientists, nor indeed climate scientists at all. This is precisely the misconception we have been challenging, following claims made by the likes of Andrew Dessler about the Inhofe 400 list. The composition of the IPCC, it turns out, is not so different. Tony Gilland points out in his review of Bjørn Lomborg’s ‘Cool It’, the IPCC expertise is spread across many chapters, with the result that most of the scientists involved will have read only a minimal proportion of any report. That’s to say, a reviewer or contributing author to WGI on glacial recession has not made any statement about his or her agreement in WGIII on what is the best way to approach the problem of climate change from a policy or economic perspective – or even on chapters of WGI to which he or she did not contribute. So the idea that the IPCC represents a scientific consensus on climate change and what to do about it is a complete misconception of the functioning of the IPCC. At best, each chapter from each working group represents the work of just tens of authors, across a range of disciplines and levels of expertise. Yet activists, politicians, and journalists will claim that de facto policy recommendations from WGIII have the support of the consensus of 2500 climate scientists. That ‘the consensus’ does not represent agreement among 2500 scientists might not be news to some people. But others are quite oblivious. We flagged up a few examples in our last post; here’s some more (courtesy of a commenter). The evidence of the IPCC needs to be treated for what it is – not as the last word on the science of climate change, but as a contribution to a political process. A political process that, despite the best efforts of the global warming fraternity (including the IPCC) to nip it in the bud with their claims that ‘the science is in’, has barely even started. Anyway, where did the whole ‘2500 climate scientists of the IPCC’ figure come from in the first place? 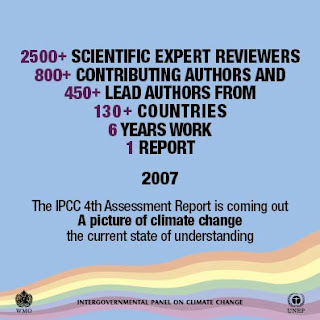 If this flyer from the IPCC itself is anything to go by, it refers to the expert reviewers. So having taken a look at the authors, we’ll have a go at the reviewers next. The IPCC certainly seem pretty proud of them. One wonders how many of those ‘scientific expert reviewers’ will turn out to be social scientists and economists that Andrew Dessler et al make such a fuss about when they turn up in the Inhofe 400, not to mention, Heaven forfend, web officers, administrative assistants and activists . Intriguingly, many warmers have no time for the reviewers. Stoat, Desmogblog and Tim Lambert claim that anybody can be an expert reviewer, which is a handy argument when you want to cast doubt on the credentials of any pesky ‘denialist’ who happens to be one, but kind of backfires when you’re trying to defend ‘the consensus’. WGIII – But is it Science? Following our breakdown of the expertise comprising the IPCC’s WGII, we’ve now done the same for WGIII, “Mitigation of Climate Change”. First, the numbers: Of 270 contributors, 66 were from the USA and UK. We haven’t been able to establish the expertise and discipline of 12 of those – yet. 14 contributors had expertise in physics, chemistry or engineering. 4 from other engineering disciplines. 2 were bio/geochemists. 5 were from forestry ecology, or soil science. 2 had expertise in law. There were 7 social scientists, and a whopping 20 economists. There were no obvious instances of administrative assistants or web designers being included on the list, unlike WGII. However, the 12 contributors we couldn’t locate don’t appear to possess a great deal of the academic credibility Andrew Dessler demands, and work for business or the US EPA – no surprises there. There appear to be fewer PhD candidates, and among the contributors who did not work in the private sector, most had academic positions. The best in the world though? It didn’t seem likely. In the first two volumes of the “Climate Change 2007” Assessment Report, the IPCC analyses the physical science basis of climate change and the expected consequences for natural and human systems. The third volume of the report presents an analysis of costs, policies and technologies that could be used to limit and/or prevent emissions of greenhouse gases, along with a range of activities to remove these gases from the atmosphere. It recognizes that a portfolio of adaptation and mitigation actions is required to reduce the risks of climate change. It also has broadened the assessment to include the relationship between sustainable development and climate change mitigation. If you put two economists in a room, you get two opinions, unless one of then is Lord Keynes, in which case you get three. Somehow, the IPCC has managed to stuff more than 20 economists in a room, and achieved a “consensus”. Remarkable. Once upon a time, economics was a matter of politics. Now, it seems, economics is as much a matter of rock-solid objective fact as physics. The problem is, though, that environmental economic orthodoxy cannot be challenged politically – especially in the UK – because all politicians hide behind the “scientific consensus”, even though it is formed by a large number of economists and social scientists. Drawn up by more than 2,500 of the world’s top scientists and their governments, and agreed last week by representatives of all its national governments, the report also predicts that nearly a third of the world’s species could be driven to extinction as the world warms up, and that harvests will be cut dramatically across the world. For the first time in six years, more than 2,000 of the world’s top scientists reviewed and synthesized all of the scientific knowledge about global warming. The Fourth Assessment Report makes clear that the accelerating emissions of human-generated heat-trapping gases has brought the planet close to crossing a threshold that will lead to irreversible catastrophe. Yet like Cassandra’s warning about the Trojan horse, the IPCC report has fallen on deaf ears, especially those of conservative politicians, even as its findings are the most grave to date. We must also be ready to take decisive measures to address climate change. It is no longer so hard to imagine what might happen from the rising sea levels that the world’s top scientists are telling us will accompany global warming. Who can claim that we are doing enough? For any (ahem) sceptics out there, note that this is firmly within the territory of WGII and WGIII, in that it is about predictions, and not scientific evidence for climate change and its causes to date. In November, we ran a post about Green MEP Caroline Lucas’ comments about there being just 8 years left to create policies to save the planet. When we rang them, Lucas’s press office cited WGIII AR4 as the basis for her comments. As a result of her campaining – in part – the EU passed legislation to cap emmissions from aircraft on that same day. The same arguments, based on the same ‘consensus’ created by WGII and WGIII are being made by the major UK political parties, who, as we have also reported, are promising 60, 80 and 100% carbon reductions by 2050. Science or politics – wodjafink? Author EditorsPosted on December 30, 2007 Categories BlogTags 2500 climate scientists, Andrew Dessler, Caroline Lucas, consensus, IPCC7 Comments on WGIII – But is it Science? NOTE FROM THE EDITORS. 13 December 2008. This post is linked to from other sites more than any other. This has lead to criticism that we have been dishonest in ignoring the scientists in IPCC WGI, which is where the bulk of the scientific analysis is done. It is true that this post does focus on the work of WGII, but it is not true that we do not look at WGI. We do it here. We also look at WGIII, here. The complexity of climate change does not suddenly make a sociologist, economist, computer programmer, etc. a credible skeptic. In fact, the weakness of Inhofe’s list is readily apparent by the very fact that he had to include such people on his list. The crown jewels of skeptics are Lindzen, Christy, Singer, etc., but as I’ve said before, there are only a small number of them. In order to bulk up the list, Inhofe lowered his criteria to basically include anyone who doesn’t believe in climate change — regardless of their technical background in the subject. As far as my analogy being unsuitable, I stand by it. If your child is sick, you take him/her to the experts. Ditto if your planet is sick. You don’t take either your child or a planet to a sociologist or economist. For the uninitiated, here is the lowdown: Andrew Dessler is a professor at the Department of Atmospheric Sciences, Texas A&M University. He is complaining about a US senate report which listed hundreds of individuals who have been reported in the media during 2007 as speaking against the “scientific consensus” on climate change, claiming that they are scientists. The report naturally challenges the very principle of the consensus, which has given climate policies the authority they have needed to be carried forward. The global warming camp have sought to undermine the value of this new list, by claiming that the scientists lack scientific qualifications, expertise, or moral integrity. But Dessler has made a significant concession here. He is visibly shifting from the idea that the power of the consensus comes from the weight of scientific opinion – numbers. An “overwhelming number” of scientist’s opinions might indicate that the “science” had been tested. Now, you have to be qualified to have an opinion on climate change. But Dessler doesn’t tell us exactly how we are to measure the qualifications, we just have to take his word for it that the 400 sceptics aren’t qualified, but the IPCC scientists are. So it’s not simply a consensus, it’s a qualified consensus, and he gets to call the qualification. So much for science. So, apparently, the IPCC scientists who represent the consensus are more qualified than their counterparts. They are akin to the experts you would trust your desperately ill child to, not the ragbag of mavericks you would avoid. Worse still, many of the sceptics are in fact mere computer programmers or – gasp – sociologists! We decided to test Dessler’s claim. So we downloaded IPCC WGII’s latest report on “Impacts, Adaptation and Vulnerability”. There were 380 contributors to the report [PDF of contributors]. A thorough and exhaustive analysis of the backgrounds of these experts (or were they?) was too ambitious (it’s Christmas, and we have wine to drink, and mince pies to eat, too). So, we focused on the contributors who operate in the UK. Of the 51 UK contributors to the report, there were 5 economists, 3 epidemiologists, 5 who were either zoologists, entomologists, or biologists. 5 worked in civil engineering or risk management / insurance. 7 had specialisms in physical geography (we gave the benefit of the doubt to some academics whose profiles weren’t clear about whether they are physical or human geographers). And just 10 have specialisms in geophysics, climate science or modelling, or hydrology. But there were 15 who could only be described as social scientists. If we take the view that economics is a social science, that makes 20 social scientists. This gives the lie to Dessler’s claim that IPCC contributors are analogous to medical doctors. There are economists working on saving that dying child!!! That’s got to be wrong, by Dessler’s own standards. Nonetheless, were these contributors the “experts” that Dessler claims they are? There were a few professors, but few of them had the profile Dessler gives them. Many of them were in fact, hard to locate to establish just how much better than their counterparts they were. One professor (Abigail Bristow) wasn’t what you’d call a climate scientist, but a professor of Transport Studies at Newcastle University. How is she going to cure the sick child? Will she be driving the ambulance? Another Professor – Diana Liverman at Oxford University – specialises in “human dimensions of global environmental change” – Geography is a social science too. Another – John Morton of the University of Greenwich, specialises in “development Anthropology”. Professor of Geography, and Co-Chair of IPCC WGII, Martin Parry’s profile merely tells us that he is “a specialist on the effects of climate change”. But what does that actually mean? Among the remainder – most of whom are not professors, but research associates at best, are an assorted bunch, many of whom are better known for their alarmist statements in the mainstream press than they are for their contributions to scientific knowledge – activists in other words, with their own political motivation. And in spite of being reported as “climate scientists”, involved in scientific research, also seem to be working within the social sciences, albeit for “climate research” institutions, such as Tyndall. Johanna Wolf, for example, is an IPCC contributor from the University of East Anglia, who works in the department for “development studies”. Does that make her a climate scientist? Anna Taylor, of the Stockholm Environment Institute in Oxford has no PhD at all, her research focuses on “stakeholder engagement in adapting to multiple stresses, including climate variability and change, water scarcity, food insecurity and health concerns” – not climate science, and has simply not been alive long enough to join the ranks of the specialists of specialisms that Dessler demands of sceptics. Similarly, Susanne Rupp-Armstrong, listed as a member of Southampton University only appears to have ever contributed to one academic paper. Research Associate at the University of East Anglia, Maureen Agnew does not focus her research on climate science, but on such things as “Public perceptions of unusually warm weather in the UK: impacts, responses and adaptations”, and “Potential impacts of climate change on international tourism.” Katherine Vincent specialising in “Social Capital and Climate change” at the UEA, only began her PhD thesis in October 2003. How can she be cited as a specialist in climate science? Then there are the contributors whose involvement we cannot explain. Farhana Yamin is an international lawyer, based at the University of Sussex. Rachel Warren and Paul Watkiss are merely listed as “environmental consultants” at the latter’s consultancy firm, and clearly have a commercial interest in climate change policies being developed. Kate Studd is listed as a contributor, but she works for the Catholic Agency for Overseas Development, and doesn’t appear to be an academic at all. What are these people doing on this list of the most expert climate specialists in the world? We were surprised by the results. Was the prevalence of social scientists from the UK representative of the whole group? We decided to repeat the test for the contributors based in the USA. h/atmospheric sciences. Again, we gave the benefit of the doubt to geographers where it wasn’t clear whether their specialism was physical, or human geography. Well, we can all play that game… Included as contributors to WGII are Patricia Craig, Judith Cranage, Susan Mann, and Christopher Pfeiffer, all from Pennsylvania State University. It’s not that these people aren’t experts in their field – they probably are. Our problem with their inclusion on the list of Contributors to the IPCC WGII Fourth Assessment report is that their jobs are (in order) website-designer, administrative assistant (x2), and network administrator. Also on the list is Peter Neofotis who appears to be a 2003 graduate of Ecology, Evolution, and Environmental Biology from Columbia. Are there many experts in anything who graduated in 2003? Would Dessler take his sick child to a doctor, who, according to our understanding of medical training, would have not yet qualified? Also at Columbia is Marta Vicarelli, who is a PhD candidate in ‘sustainable development’. Can she be the amongst the world’s leading experts on sustainability? It seems hard to take the claim seriously. Or what about Gianna Palmer at Wesleyan University, who, as far as we can tell, will not graduate from university until 2010? Inhofe’s list is chock full of people without any recent, relevant research on the problem. In fact, I’m pretty sure that’s why they’re skeptics: people with the relevant experience are immediately persuaded by the evidence. This should be compared to the IPCC, which includes exclusively people with recent, relevant expertise on the problem. Anything which can be thrown at the sceptics can be thrown at IPCC contributors. That is not to say that social scientists and computer programmers have nothing to offer the world, or the IPCC process. They are crucial in fact. What it is to say, however, is that, when social scientists, computer programmers and administrative assistants comprise a significant proportion of IPCC contributors, the global warmer mantra that the IPCC represents the world’s top 2500 climate scientists is just plain old-fashioned not true. Dessler’s wish to maintain that the IPCC comprises unimpeachable experts in their field mirrors the common desire to create an unassailable scientific consensus that political changes in the world are a necessity. This is driven less from the data generated by these experts – they aren’t as expert as is claimed, and the consensus is not unassailable – and more to do with the desire to drive politics by creating scientific orthodoxy. This would be scientism, if there was any matter of science about it. The only claim to authority that the IPCC has is not tested, scientific expertise, but just the fact of being established as an authority. There is obviously no substantial attempt to select the best in the field to contribute, as there is no objective measure of such expertise. If we do not take the view that IPCC’s authority rests on its contributors’ expertise, then the consensus it generates is meaningless. It is merely a ‘ministry of truth‘ – the existence of which is only designed to reduce inconvenient challenges to political, not scientific, orthodoxy. The problem is not the several dozen credible skeptics on Inhofe’s list, some of whom you’ve named, it’s the 350 others. Overall, There are nowhere near 400 credible skeptics on his list, or on the planet. Even if it were possible to draw together the best scientific minds (and perhaps even the best sociologists and programmers too), would it even be desirable? Science has never ‘worked’ by measuring opinion, but by testing hypotheses. It doesn’t work by generating orthodoxy, but by challenging it. The IPCC doesn’t represent the best available understanding, but the paucity of understanding of the factors governing climate. If the ‘truth’ really is ‘out there’ then it doesn’t need to be decided by committee. Author EditorsPosted on December 28, 2007 Categories BlogTags 2500 climate scientists, Andrew Dessler, consensus, IPCC86 Comments on Physician, Heal Thyself. The question is: does their opinion matter? Should you revise your views about climate change accordingly? To understand why Inhofe’s claims are fundamentally bogus, consider the following scenario: imagine a child is diagnosed with cancer. Who are his parents going to take him to in order to determine the best course of treatment? Dessler goes on use the tragic image of a hypothetical child with cancer, by saying that you would not take the child to any old doctor, but a specialist of a specialism. The trouble for Dessler is that the earth is not a child. And climate scientists are neither doctors, nor pathologists, let alone pediatric oncologists. Let us use, instead of a child with cancer, a happy little puppy dog. Somebody presents themselves as an expert, and tells you that the puppy dog is terribly, terribly sick. But you look at the puppy, and to you it seems to be perfectly normal. It wags and chases its own tail. It investigates every new object and smell, runs around, eats a bit, and falls asleep. You challenge the expert. He says that unless you do as he says, according to the computer model of a puppy he has devised, the real puppy will die in a horrible, horrible way, and it will all be your fault. Do you want to be a puppy murderer? But since climate science and medicine are not the same thing, Dressler’s analogy breaks down. Doctors and vets in the world that the poor little puppy dog and the tragic cancer child inhabit, have not done clinical medicine degrees, just some very basic biology. No therapy has ever been tested. No diagnosis has ever been proved. In fact, nobody has ever seen a sick puppy, nor a case of cancer before. It is just the untested view of the experts that the child has cancer, and the puppy will die unless you make changes to the way you live your life. Such is the state of climate science in this world. Is the Earth really “sick”? It still spins. It still rains. It still works. Perhaps the expert has confused a change in the puppy’s behaviour with there being something wrong. So given the critical nature of the climate change problem, who should we listen to? My opinion, and the opinion of all the governments of the world, is that we should listen to people who specialize in climate science. That’s the IPCC. What is conspicuously absent from all of this debate about which scientists to believe? Science. It’s the science, Stupid. Yet Dessler asks us not to consider the science, but who we would trust a dying child to. Yet it is not the case that even “most” scientists at the IPCC are climate scientists, but exactly the “large number of social scientists, computer programmers, engineers, etc., without any specialist knowledge on this problem” about whom Dressler complains. Dressler is wrong about the expertise of the IPCC. Neither is it the case that the IPCC scientists represent the “best in the field”. For a long time, climate orthodoxy has hidden behind “the consensus”. Environmentalists have attempted to defend the idea of this consensus, because it has invested all of its currency in the fact of its existance. If the consensus doesn’t exist, how can the environmental movement proceed with legitimacy? We have already heard arguments about how this new group of scientists lacks authority, expertise, and how these scientists might be funded by Exxon Mobil. Anything but science. The consensus only exists by diminishing the moral character or professionalism of those who do not agree, not by allowing competing theories to be tested by the scientific process. If it carries on like this, the environmental movement will prevent science from being part of the process which forms the scientific consensus on the climate. Climate science will eat itself, tail first. It is a sick puppy.